I can think of so many reasons to adore the lowly canned tuna fish: It’s affordable. It’s high in omega-3 fats (psst… those are the ones that are good for your heart, your mood and your skin). I love that I can store it in my cupboard until just when I need it. And it’s such a versatile ingredient. Plus, canned albacore tuna has low levels of mercury and is a sustainable choice if it’s labeled as troll- or pole-caught, from the U.S. or British Columbia. Another healthy choice is chunk light tuna, which comes from the smaller skipjack or yellowfin, and has less mercury than canned white albacore tuna. The FDA/EPA advises that women who are or might become pregnant, nursing mothers and young children consume no more than 6 ounces of albacore a week; up to 12 ounces of canned light tuna is considered safe. So when I think of the injustice done by drenching the poor canned fish in so much heavy mayonnaise you need an ice cream scoop just to ladle it onto your sandwich, I feel like I need to have an intervention. This streamlined version of a northern Italian favorite is perfect for a summer evening: no-fuss, no-cook and big taste. You can even make it ahead and store it, covered, in the refrigerator for several days. 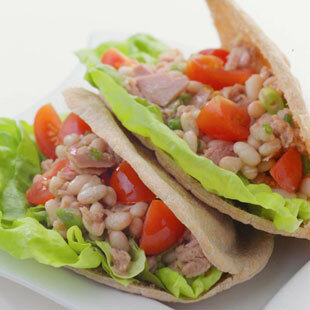 Packed with protein and fiber, this tuna-and-bean salad is ready in a flash. Serve with warm crusty bread or pack it in a pita for a sandwich. For an extra kick, add a pinch of crushed red pepper or cayenne. This quick, easy remake of the Provençal standard turns a couple cans of tuna into a main-course salad that’s just waiting for a glass of crisp Chardonnay. Inspired by the Italian dish spaghetti al tonno e pomodoro, this quick and healthy pasta is a staff favorite at EatingWell. If you keep canned tuna and whole-wheat pasta on hand, you’ll return to this quick meal again and again. Known as Tuna-Pea Wiggle to some, this family-friendly tuna noodle casserole tends to be made with canned soup and whole milk, which means high fat and sodium. In this healthier EatingWell version, you make your own creamy mushroom sauce with nonfat milk thickened with a bit of flour.